This is the official Auckland Airport App to help make your airport experience enjoyable and stress-free. Bringing travellers a one-stop planning tool to improve their airport and travel experience - regardless of airline or class of travel. The app includes features such as live notifications of when to leave home to catch a flight, taking into account real-time flight information and traffic congestion. It also provides an easy way to make parking and lounge reservations and duty-free purchases online. Travellers can also access the latest information on the exchange rate, weather and local time at their destination. - complimentary food and beverage offers. As well as earning points you can convert points into eVouchers, helping you get more out of your trip. 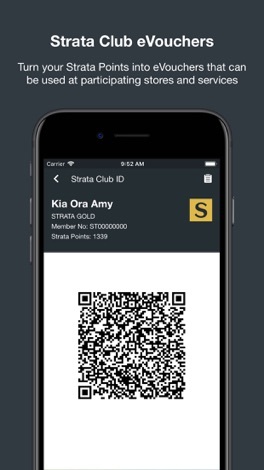 You can start making the most of Strata Club right away from the Auckland Airport app. The app’s benefits extend well beyond Auckland Airport. Our partnership with TripIt allows users to keep all their travel plans - from flights and hotel reservations, to rental cars and activities - organised and in one place. 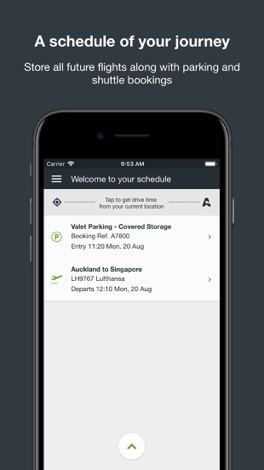 The partnership includes an integration between the Auckland Airport app and TripIt with a host of new features that will ensure your journey, both to and from the airport and while travelling, is as easy as it can be. 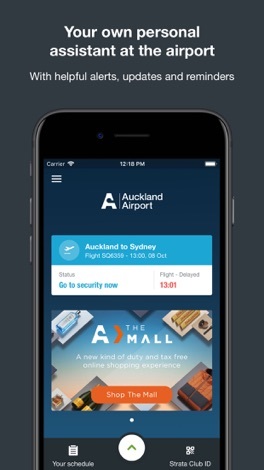 The Auckland Airport app also includes information on food and beverage offerings at the airport, the ability to book transport to and from the airport, the option for travellers to download an offline map of their destination, as well as the functionality to add multiple journeys to an app itinerary. 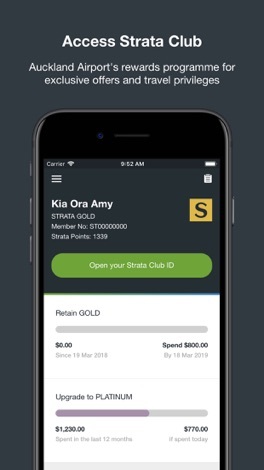 - Strata Club, Auckland Airport’s rewards programme, your fast track pass to exclusive offers and travel privileges at Auckland Airport. - Book parking or Valet parking and grooming and have it automatically added to your schedule. - Book the Super Shuttle and have it automatically added to your schedule. - Live status of every flight to and from Auckland. Any destination, any airline. - Explore Auckland Airport’s food and tax and duty-free shopping options. 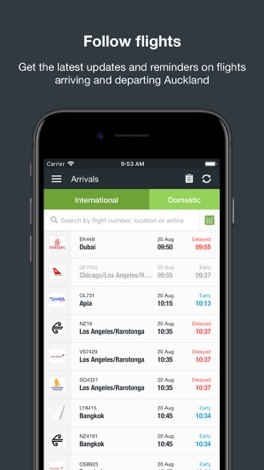 - Be alerted when to leave home to make your flight. - Relax in the emperor lounge - No matter what airline or class. - View up-to-date details of all your flights regardless of airline. - Share your travel details with your friends or family. ### Full Access to over 1500 video guitar lessons ### Guitar Jamz is the number 1 video resource of guitar lessons from the internet: Beginner Guitar Blues, Acoustic Easy Songs, Funk Guitar, Awesome Jam Tracks, Country Lessons.